Come check out my friend Patricia’s first hands-on urban gardening class, which will focus on organic gardening and permaculture strategies. The class will be $150 for ten sessions on Thursday nights from 6 to 7:30 pm, starting July 15th and running through September 23rd (no class on September 2nd). Class size is limited and I’m already a week behind in posting this, so sign up soon if you’re interested! 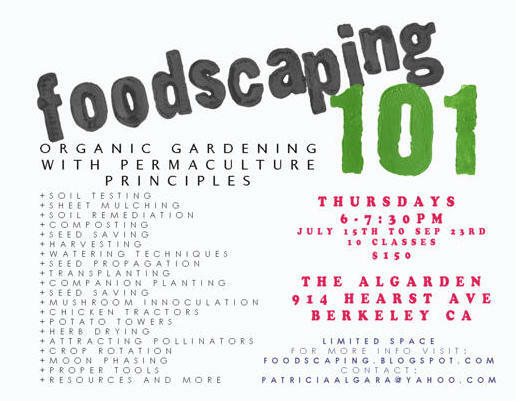 For more information on Patricia, her amazing garden, and her new class, check out her blog: Foodscaping.